This resort encompasses three separate properties, all of which share the numerous leisure facilities. This is a large and friendly resort with high standards of service. 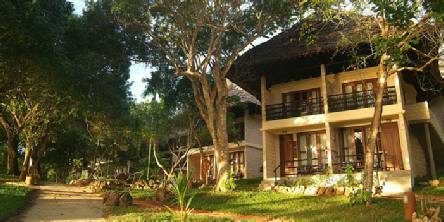 Situated on Diani beach on the south coast of Mombasa. Approximately a 1 hour 30 minute drive from Mombasa airport plus a short ferry transfer. Approximately a 20-minute drive from Ukunda airstrip. The main Baobab building has 183 rooms across three categories. All rooms in the main building have en suite bathroom with shower, air-conditioning, telephone, mini fridge, electronic safe, hairdryer, satellite television and balcony or terrace. The garden bungalows have a garden view and the superior bungalows include tea/coffee making facilities. The Maridadi Wing has 56 air-conditioned rooms with en suite shower, telephone, TV, safe, mini fridge, hairdryer, tea/coffee making facilities and balcony or terrace. Superior rooms are sea facing (2 adults and 2 children or 3 adults). 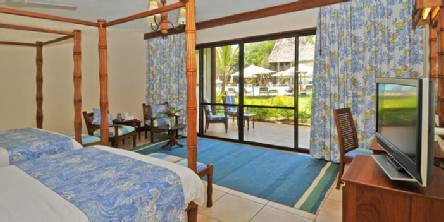 Deluxe rooms and Deluxe Bungalow rooms (2 adults and 1 child or 3 adults). The 84 Kole Kole rooms and junior suites feature the same facilities as the main building, and the deluxe sea-facing rooms also include a fruit basket and welcome gift. Leisure facilities include a 3-tier swimming pool in the Maridadi Wing and the main pool at Baobab. Other facilities include tennis courts, table tennis, beach volleyball and a TV lounge. A host of water sports* are available including windsurfing, kitesurfing, scuba diving, big game fishing, glass-bottom boat trips and snorkelling. (Not all water sports activities are part of the all inclusive package). The Afya Bora Wellness Club & Spa* offers a huge range of relaxing treatments. The Porini Amphitheatre hosts live evening entertainment and a late night disco. The resort has a selection of restaurants, bars and lounges offering an extensive variety of food and drinks. ALL INCLUSIVE HOTEL - price includes: MEALS & SNACKS: Breakfast, lunch, dinner (at selected restaurants) and snacks (10am-5pm) DRINKS: Local soft drinks and local alcoholic drinks (10am-11pm). 2019 package holidays to the Baobab Beach Resort, Mombasa Prices are per person based on two sharing, including flights, transfers and accommodation, and are subject to availability. Flights from Heathrow - other departures also available, call for details. Holiday ref: S0517W.